I have gotten back into a regular musical practice. While this is good for me, it doesn't lend itself well to blogging. I've made progress on Karen Marshalsay's "Key Techniques for Harp." That got me back to the ap Huw manuscript, and I'm reading Paul Whittaker's thesis. His take on the tunings makes some sense to me. I've also been monkeying with the "24 measures" of Welsh music as given in the MS - sort of a series of chord progressions, except there's only two chords, 1 and 0. Reading Whittaker, I'm getting more sure that I have totally incorrectly parsed what's a 1 and what's a 0. Onward! I assumed that 1 would be Dorian home (plus a third and a fifth above) - like it is for, say, Brian Boru's March. Then 0 would be a whole step below Dorian home, with its associated third and fifth. It's more like 1 is home and 0 is an away that's a whole step above, but there's at least one note shared between the two. The 7 Warranted Tunings are then thrown into the mix. If I'm reading Dooley right, exactly what pitches are home and away change based on what tuning you are using. So 1 can be Dorian, if you're in that tuning. If you're in the most basic and commonest tuning, 1 is actually the major key! And I was finally hit with inspiration for an "Atlantian style" song I have been wanting to write for a while. Right now, it's not saying quite what I set out to say... that should probably be its own blog post. Trouble always is, I want to do ALL THE THINGS and so end up doing none of them. Too overwhelmed. I will take one (1) (uno) (not a couple) (just one) of the apHuw patterns as a warm up, and improvise on it. Then, I will take one (1) (etc.) of the songs I have printed out - either the kantele ones, or the Regia Anglorum ones - and do it 5x through. They are mostly super short, so this isn't a big time sink. I think to start, I will do this on the harp. It was a good War for bardic for me. I want to remember what happened, when, and what I learned, so I am writing it down. I'm not going to brag, but I am going to note what I accomplished. Saturday: I taught my 'Developing Historically-Informed Performance' class. It was reasonably well-attended (10-12 people?) and the students were engaged. Two people (including Master Efenwealt) told me they'll be stealing the class notes to teach students of their own. Sweet! Saturday night may have been the night Lord Richard Wyn requested 'To Put the Devil Into Hell.' That would be the first time someone has asked me to do one of my period pieces, I think. Yay! I stopped in to visit Mistress Dervila, who unfortunately and unfairly broke her ankle at War. Her husband Thomas Drum-Maker and Baron Talorgen were there as well, and we had a bit of a mini-bardic for a while. Along the way, I mentioned the Irish saint and the otter story I wanted to put together, but was having a hard time getting to gel. She asked when the last time I read the source material was; I guessed a few months. She said that was about the right amount of time to get some distance from it, so I could re-imagine it as the story I wanted to tell. What was the point? I protested that figuring out the point was my problem, but after a few days of ruminating on it (with 'permission,' as it were, to deviate from the source), I feel like I'm making progress. So it was really very good and helpful advice. Sunday: I did 'Beowulf challenged by the coast guard' for the Atlantian Royal Bardic circle. I used my lyre (not the harp, which I've practiced with more), and the sleeve of my red cote kept buzzing against one of the strings (which at least two people noticed). Anyhoo. Master Rhuaidhri suggested that, although many people at this circle got the reference and where this was from, and that it was really cool, I might want to go with a more visceral battle scene to grab the attention of the non-English majors in the crowd. We spoke more on Tuesday, and he had very good advice on appealing to the kinesthetic learners in the crowd. I respond well to images (I am hugely visually oriented) and also sounds, so that's where I tend to go. But there are people for whom images are just a big pile of 'meh,' and they need to hear how things feel in the body. "Show, don't tell," in other words, but a much more targeted take on it. A lady performed a song she later told me was for the Gulf Wars War Bard competition. Not being a fighter but rather a waterbearer, she wrote a piece from the point of view of a female camp follower, a medic. She sang it as a fight song - fighting to save soldiers' lives - with as much passion and determination as any war song might have. I got shivers. We get some songs about service and kind deeds, but not generally ones that make it so outright heroic. I hurried over afterwards to let her know how much I liked the song, and gave her the pin suite I was wearing. Alas, kinda useless if you're not wearing 7th century Kentish, but I was out of other tokens in my bag. I also took Magistra Fiona of Clare's class 'Introduction to Old English.' Excellent class - not only did she hit the expected notes of how to pronounce which letters and such, but she explained some of the tricks you need to navigate the glossaries. That's gold, right there. I did not get to attend her poetry class, but I mean to email her to ask for the handout. The Internet and associated technologies have made it easier than ever for bards to write and share new material. Bards who have written their own material, or learned interesting new material, are generally justifiably proud of this work, and they want to display/perform it. Add to this a large bardic circle, where you may only get one or two chances to perform, at the largest event in the Known World, with many Notable People in attendance. You will, naturally, reach for these pieces you've worked so hard on that you want to share. And there is nothing wrong with that. However, if you're one of the audience members who wants nothing more than to shout "MacIntyre!" at odd intervals, this is not going to be very entertaining. More on this under Wednesday. Monday was also Poetry Day in Artisan's Row. I stopped by and chatted for a bit with Lady Katarzyna Witkowska (who was organizing it), Master Cerian Cantwr, and Master Olivier de Bayonne. It was good to finally put a face to Master Olivier's name. The Known World Poetry Competition was canceled on account of mine being the only entry, but we sat and chatted for a while. Lady Katarzyna requested a poem from those departing; Master Cerian warned us of the dangerous Polar Cow. I recited 'I Drank of Mnemosyne,' which I had printed out from the replacement for Mystic Mail, so that I could perform it at the Depressing Song Competition. Master Olivier gifted me a token, which greatly lifted my spirit. The pieces I write for competitions frequently don't turn out so well (because they're written to spec rather than from the heart) so it was heartening that this one was well-received. Tuesday: I ran through 'Mnemosyne' in my camp a few times, trying to see if I could get the music out well enough. It didn't settle down to a single tune, but it seemed to have a pretty solid musical idea that I was improvising on fairly well. I waffled on whether or not to go ahead with it, but - I'm the one who wants to go toward improvisational music and even poetry composed on the instant. Let's see how it goes! 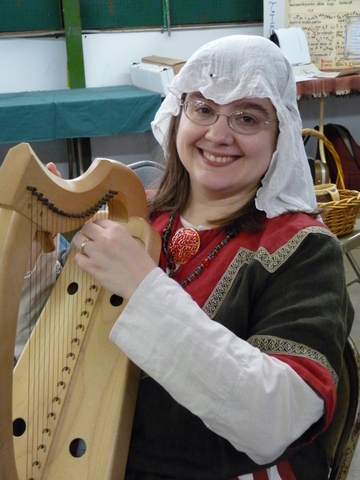 So I took the Pennsic Main Stage for the second time (I thought it was the first time, but no - I did my 'Beowulf' for the KW Harp Celebration last year) and improvised away. I had the lyrics in my hand, but only needed to consult them occasionally. There were one, maybe two phrases where the music didn't land as solidly as I would have liked, but overall - I felt like it went very well. I think I emoted and gestured without overdoing - easier on such a downer piece than the peppy ones, where I can get spastic pretty quickly. I thought I saw at least one person wiping away tears. A friend was in the audience, and afterwards, he asked if that was "Alzheimer's, but for the SCA." So that aspect of it is getting through. I made 4th place (in a field of eight or nine entrants)! But even more squee-inducing - the 3rd place winner was a lady from far Lochac with a stupendous voice and fantastic presence. She accepted the accolade, but couldn't take her actual physical prize on her return journey - so she turned and gave it to me. So very sweet of her. I also learned an important lesson in discernment at the Windmaster's Bardic and Peep Sacrifice. Wednesday: Children's Fete. Two and a half hours of performing in a huge noisy barn. Master Rhuaidhri and Mistress Fevronia undoubtedly carried the afternoon with their amazing projection skills. I think I managed some volume and managed to not destroy my voice. I really need to get some classes for improving projection and volume. Wednesday was also the Bardic Symposium session where I was a panelist: Authenticity. The two-hour discussion seemed to come down to Don't Be A Jerk, Stop Jerks from Jerking, and Lead By Example. 'Don't Be a Jerk' covers any and all performers who poop all over other people's performances - for being too period or too not-period - to make themselves feel better. 'Stop Jerks' encouraged bystanders who might be witnessing the Jerk in the process of pooping to step up and intervene. And 'Lead By Example' meant that, whatever your feelings on performance and authenticity, you should do the thing you want to see done and do it so well it looks cool. There was a second strain that ran through the conversation. At first blush, it was the old 'fun vs. authenticity' problem, but Lady Lorelei of Skye clarified it. In addition to bardic being an art that we can re-create in a historical fashion, it is also a social function. Like at the Southwind bardic, the general non-performing public wants certain things from bardic circles. If we stop providing them, we risk marginalizing the bardic community. On the other hand, we are an educational organization, and as artists with an interest in historical performance, we want to do those things, too. There was much talk of 'proper performances in their proper places,' implying that 'fun' and 'authenticity' have to stay in their separate boxes. Nothing wrong with focused bardics. But I think I'd like to see general bardics with better balance. Old standards plus new art. The thing there is, this isn't like putting together an album or even a playlist for a singalong, where one person engineers the tempo of fast/slow, fun/serious performances. You've got a mixed group of performers. If the circle is big and the performances are long, you get everyone pulling out their Most Impressive Piece, which will generally tilt the thing toward the serious and slow, and away from the Old Chestnut Standards. Keeping it smaller and faster-moving, and you'll have more room for variety. Thursday: The humidity was making the heat just unbearable, and I left War early. I had to cancel the Lyre Roundtable, which I regretted, but I was feeling pretty miserable. In the car, I thought some more about St. Kevin and the Otter (currently entertaining a version of Goose that Laid the Golden Egg, or else a parable on the hazards of self-denial). I was also struck with the thought to write a song about the frankly amazing ability the fighters (of all kinds) have to tolerate said evil heat and humidity. I got a draft refrain figured out somewhere on I-79. Fighters, can you tell me, how have you beat this heat? The (Welsh) ap Huw manuscript gives 24 "measures," sort of like chord progressions (but not really), in its characteristic "binary notation" of 1's and 0's. Welsh bardic poetry has 24 different verse forms. A first cut at lining them up is... not terribly encouraging. There are some measures that would apply very well to some of the poetic forms, but many that don't. If you're assuming a one-syllable-to-one-number ratio - that is, that: 1101 * 1101 corresponds directly to two sets of four syllables. I may be wrong to jump to the conclusion that because 24 = 24, these two things are obviously meant to go together. For further reading, Standing Stones has a good discussion, this page from Bill Taylor might help, and this FAQ by Mistress Tangwystl (Heather Rose Jones) is interesting. Storvik is fighting like gods! Well, the baron was well pleased, and asked for some more songs praising other folk in Storvik. Trivia: In setting the tune for this, the chorus was driving me mad. I felt certain that I'd "borrowed" a tune from something, but could not for the life of me place it. My husband identified it: "The Horn of the Hunter," (albeit on fast forward) which is something that he sings, but I don't. Evidently I'd heard it enough from him that the tune seeped into my brain, but nothing else about it. There's one for the A&S folks, too, although I'm still polishing it over and developing the tune. The chorus is good, but some of the verses haven't been worked over. This one, I have to fight the urge to steal the verse tune from "Worms of the Earth." Do You Have Dwarves in Storvik? Craftsmen fit for the gods? Is the armor from Weyland the Smith? Only took me two months to pull this together for Mistress Linette: Link goes to MP3. I mentioned the Winchester Troper in an earlier post. As it happens, I came into some Amazon.com gift certificates and as a result, "Christmas in Royal Anglo-Saxon Winchester," a CD of music from the troper, arrived yesterday. I was slightly disappointed that the liner notes didn't include any mention of how they reconstructed the music. That's probably a lot to ask from liner notes when there's a $220 book on the subject available. But I was hoping for a crumb or two. 1) Yeah, that's chant. I really have to focus or else my mind wanders. 2) But if I do focus? Sweet. There's something about the melodic structure that makes it pop just a little more than some of the other chant I've listened to. I could see using some of this music for contrafacta. I've got a Cambridge Song - a haunting poem about a woman scouring the sea-shore for her absent lover - that I'd love to set to music. 3) Organum: wow. The CD opens with two monophonic pieces, and then the organum (early harmony) hits you. By modern homophonic standards, it's a thin, two-voice harmony at strange intervals. But after listening to extended monophony, it's just an amazing difference, like an orchestra suddenly swelling up from underneath a flute solo. Only not quite, because you're not suddenly lost in that sea of sound... eh, I'm not doing it much justice. I've got Sequentia's "Edda" which makes similar switches between monophony and organum-like singing, and I don't find it nearly as affecting as this. Possibly it's a matter of pitch - Sequentia's paired singers are usually two women, whereas this recording features mostly male voices (there's one female soprano). The Winchester Troper is an 11th-12th century manuscript containing some of the earliest music in England. There's a new facsimile edition out. The $220 price tag is rather steep, but it's also at the UMD Performing Arts Library (in the Reference section, alas, so no checking it out). The same scholars have put their learning into practice, with a CD of music from the Troper also available. At $47, the CD ain't cheap, either, but I may just have to pick it up. I am finally, finally buying a Korg OT-120, an electric tuner that supports Pythagorean temperament! And, between the Amazon.com discount price and $50 of credit card "rewards" coupons, I'm getting it for under $25! I think it's taken me so long because I had the Korg OT-120 pegged in my head as "expensive outlay." Over $100! I could buy several books or CDs for that! But it's also really well past time I got it. My ear isn't good enough to do "circle of fifths" unassisted tuning; I can barely hear the resonance on the wire harp and don't hear it at all on my other instruments. Even on wire, I seem to hear it quite a few cents on either side of true tone, so I just don't trust myself to get it right that way. Gut strings will likely be the next major investment; we'll see how long it takes for me to get around to that. The lyre tunebook is chugging along. I've scored seven 19th-20th century pieces, like "Twinkle, Twinkle" and "Ode to Joy," that people will already be very familiar with. That (in theory) helps them know if they're playing the instrument "right." And I've also scored eight 12th - 16th century tunes (or parts of tunes) to be all medievally. Maybe "scored" is the wrong word. It's just melodies at the moment. I'll be adding some accompaniment separately. Of course, none of that repertoire is really historically appropriate for the lyre (although the 13th cen. Danish "Dromte mig et drom" is close). But we don't have any 8th century music, period, is my understanding. We start getting chant in the 9th cen. I may include a section on improvising tunes, and what (I think) is historically plausible, and maybe give a couple of scored examples of my own compositions. I hate doing that, if only because I'm so bad at transcribing what I'm playing into note values. It takes me forever to get it right. In the SCA, I'm known as Teleri the Well-Prepared. I sing, play the harp and lyre, and write the occasional poem. I really like doing research.